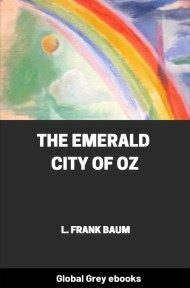 This is the second book in the Oz series by L. Frank Baum. 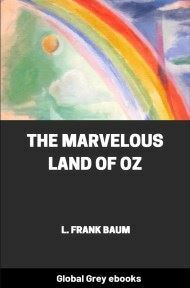 First issued in 1904, L. Frank Baum's The Marvelous Land of Oz is the story of the wonderful adventures of the young boy named Tip as he travels throughout the many lands of Oz. 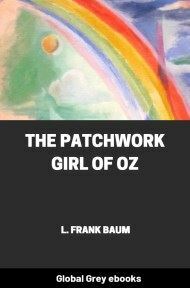 Here he meets with our old friends the Scarecrow and Tin Woodman, as well as some new friends like Jack Pumpkinhead, the Wooden Sawhorse, the Highly Magnified Woggle-Bug, and the amazing Gump. But you must not suppose he worked all the time, for he felt that would be bad for him. When sent to the forest Tip often climbed trees for birds' eggs or amused himself chasing the fleet white rabbits or fishing in the brooks with bent pins. Then he would hastily gather his armful of wood and carry it home. And when he was supposed to be working in the corn-fields, and the tall stalks hid him from Mombi's view, Tip would often dig in the gopher holes, or if the mood seized him—lie upon his back between the rows of corn and take a nap. So, by taking care not to exhaust his strength, he grew as strong and rugged as a boy may be. So he selected a fine, big pumpkin—one with a lustrous, orange-red color—and began carving it. 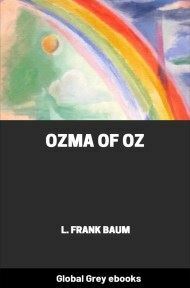 With the point of his knife he made two round eyes, a three-cornered nose, and a mouth shaped like a new moon. The face, when completed, could not have been considered strictly beautiful; but it wore a smile so big and broad, and was so Jolly in expression, that even Tip laughed as he looked admiringly at his work. 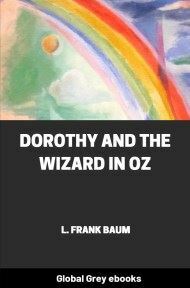 He had plenty of time to accomplish this task, for Mombi had gone to a village—to buy groceries, she said—and it was a journey of at least two days. So he took his axe to the forest, and selected some stout, straight saplings, which he cut down and trimmed of all their twigs and leaves. From these he would make the arms, and legs, and feet of his man. For the body he stripped a sheet of thick bark from around a big tree, and with much labor fashioned it into a cylinder of about the right size, pinning the edges together with wooden pegs. Then, whistling happily as he worked, he carefully jointed the limbs and fastened them to the body with pegs whittled into shape with his knife. By the time this feat had been accomplished it began to grow dark, and Tip remembered he must milk the cow and feed the pigs. So he picked up his wooden man and carried it back to the house with him.